You certainly have the skills to pay the bills. If snails had to pay bills, that is. DreamWorks Animation has experienced a roughish ride of late. Too many of their pictures just haven’t done the business. Rise of the Guardians, the recent Mr. Peabody and Sherman and last summer’s big hope Turbo. I thought it would do well. I mean, why not? It calculatingly tapped into Pixar’s success with Cars, and layered on top a strong dash of Ratatouille. Why wouldn’t undiscerning audiences flock to see it with their undiscerning little monsters? I’m still not entirely sure. I mean; it’s a production line assembled underdog story with barely an original bone in its 90-odd minute running time, but its agreeable enough. At least DreamWorks have few pretensions to artistic achievement, unlike the once great Pixar who are now adrift in a creative void. 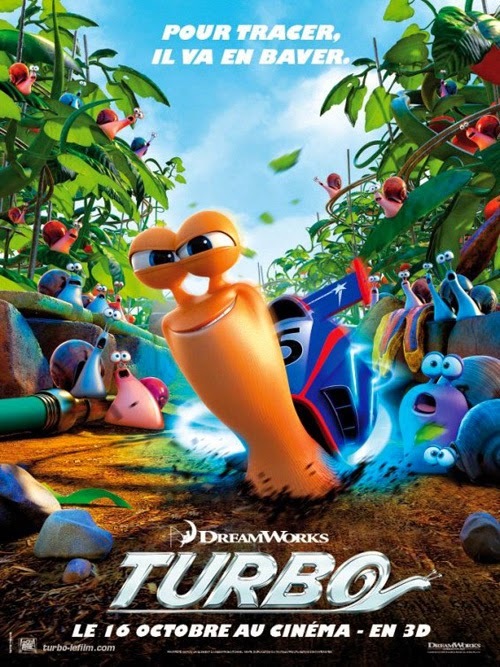 Part of the problem may have been Turbo’s blatant attempt to manipulate audiences, trying to beckon the Fast and Furious crowd (Michelle Rodriguez even voices a character), and laying on a hip hop soundtrack while importing a selection of national and ethnic stereotypes including a vain French Indy 500 champion (Bill Hader; those dreadful Frenchies, eh? ), loveably fat food-obsessed Mexicans (Michael Pena and Luis Guzman) and streetwise urban snails (Snoop Dogg and Samuel L Jackson). Or maybe failure was assured by another cast member; the kiss of death Ryan Reynolds inflicts on any movie where he’s the lead (he voices Turbo). Some have suggested the movie is condoning winning at sport through doping, as it’s only after the speed-obsessed Theo/Turbo is dunked in a tank of nitrous oxide that he becomes an all-conquering racing champion. But really, this is more akin to your classic superhero (it’s not as if he keeps having to top up, like Popeye or Asterix). In which case his entering a race is also unfair. It seems churlish too, in such an eccentric scenario, to point out that if Turbo is allowed to win by crossing the finishing line automobile-free, then his competitors should surely be permitted to sprint past him, sans car, on foot. As with any number of animations, CGI or drawn, the incidentals foster the biggest laughs. They may not flow as freely as in the Madagascar series, but much fun is to be had with the mollusc world. We haven’t seen much of the micro life recently, although there were the competing Bug’s Life and Antz way back at the beginning of the CGI era and more recently Bee Movie. It’s very considerate of these snails to consume only over-ripe fruit (perhaps to encourage kids to encourage parents not to inflict carnage on their garden fauna?) but there’s also an appealing casualness to the mortality rates in their world; “Welcome everyone to this monthly safety meeting”, “Well, there goes Jerry” as a snail is plucked into the firmament by a passing bird. There’s also a wretched little snail-destroying child, a marauding crow getting hit by a bus (the crows are decidedly non-anthropomorphic; I always find it curious how animations pick and choose their animal identifiers). Against this, the constant antagonism towards Turbo’s dreams from his kin (a rare dud from Paul Giamatti, although the continued mistaking Chet for a girl is amusing “Why is this confusing?”; perhaps a nod to most snails being hermaphrodites) is over-familiar and a little pedestrian (“When are you going to wake up?” the admonition that he is “chasing an impossible dream”). Yet the whole remains lively, knows not to outstay its welcome (a rarity now in a genre traditionally happy to wrap things up in well under an hour and a half) and features probably the best role Samuel L Jackson in a decade. He’s nigh on impossible to take seriously these days, churning out the same over-emphatic performance in film after film. So how better to embrace an actor who has become a walking cartoon than make him into one? I know, he was in The Incredibles, but here Jackson sounds not only as if he’s having fun but also he is funny as Whiplash. And you don’t have to see him perma-glowering, which is a bonus. Nothing the big two released in 2013 was pronounced in any danger of being hailed as a classic, or even particularly memorable, so it’s no wonder Disney regained its animation crown with Frozen. The one good thing about a string of underperformers is it puts the dampeners on sequel plans. In other respects, it’s likely to foster the urge to seek safer and safer sequel ground. But who knows, perhaps Turbo will be a kick in the pants? Fun as it is, it couldn’t be more formulaic.